Care for your teeth and gums. Gum disease can cause premature delivery or low birth weight. Keeping your gums healthy can prevent the transfer of decay-causing bacteria from you to your baby and prevent early childhood tooth decay in your child. Take care to treat vomiting and acid reflux related to pregnancy. For many women morning sickness accompanies pregnancy. Morning sickness includes vomiting and/or acid reflux, which cause a high risk of tooth erosion. The risk can be reduced by rinsing your mouth, lightly smearing toothpaste on your teeth, chewing sugar free gum, and always waiting 30 minutes before brushing after vomiting. 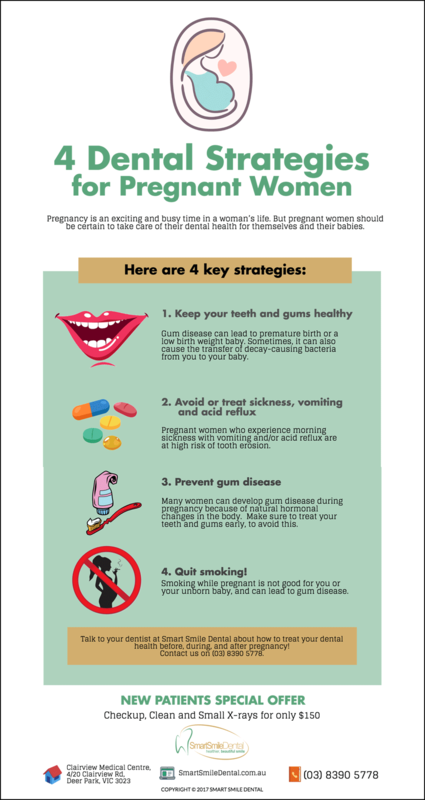 Hormones related to pregnancy can cause gum disease. Seek treatment of affected gums to avoid this. Quit smoking! All tobacco products are bad for heath! But, smoking while pregnant doubles the trouble; it is bad for you and your unborn child. Tobacco products can lead to a variety of diseases including gum disease, so quitting is best. Your oral health can effect your overall wellbeing and that of your your unborn child! Contact Smart Smile Dental in Deer Park today if you want to improve your dental and general health. Call us on (03) 8390 5778 or book your appointment online TODAY! *Checkup, Clean and Small X-rays for $150 – This offer is NO longer available.